I have been living in Goshen, Indiana since 2002, and since my mom passed away back in 2013 I lived with my uncle and my aunt. They became my guardians and I lived with them for two months! Then in December of 2013, I moved to Goldenrod which are houses for special needs people! I love living at Goldenrod and I do lots of activities. I like to do crafts, emailing, writing letters, and bowling. I go to the Shoots building, which is at the Gaining Grounds coffee shop, on Mondays, and the Shoots building is part of ADEC! I work at the South Side Soda Shop on Tuesdays through Fridays from 11 a.m. to 1:30 p.m. When we lost my sister, we knew Ashley would have a huge transition. 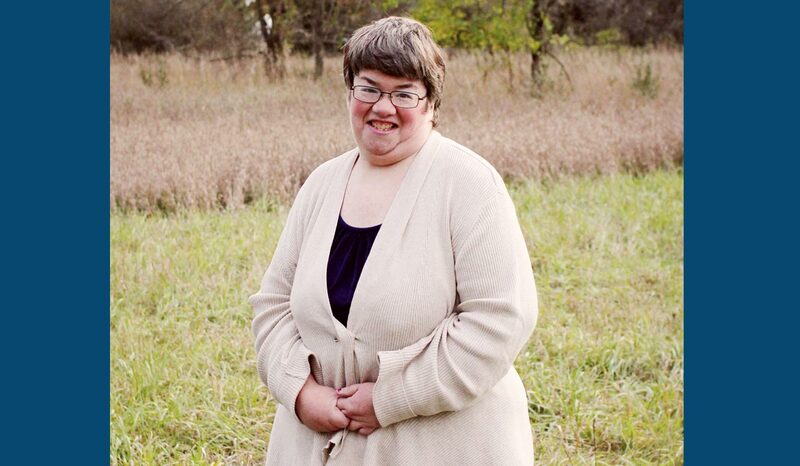 When Ashley learned living on her own at Goldenrod was an option, she was overjoyed. She had always hoped for the day when she could live on her own. In the 15 months that she’s lived at Goldenrod, we have seen her blossom. We often say that it’s like when a child goes to college, her world has expanded and she has gained confidence. We’re so grateful that she’s able to live at Goldenrod and we are able to see her throughout the week.